Wherever there is language, there will be questions — lots and lots of questions. Where does it come from? Is this correct? Should I write it this way or that way? What’s the proper pronunciation? What’s the difference between? Is there a word for that? 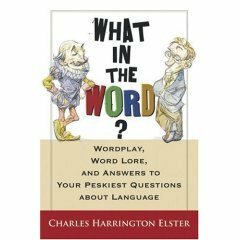 This book is for people who want ready answers to those questions, who expect to be entertained as well as informed, and who like to have some fun with words. For more than twenty years — as a writer, editor, and radio commentator — I have made it my business (and sometimes my whole waking existence) to learn everything I could about words. I have studied what they mean, where they come from, and how they should and should not be used. I have communed with the works of eminent authorities, past and present, and taken the measure of their counsel. I have lain by the fireside of English and listened to its words tell their wondrous tales. I have spent countless hours combing the pages of dozens of dictionaries, looking for the glittering gem of enlightenment. Over the years people have asked me hundreds of questions about all aspects of language, and herein you will find my answers to a great many of them — from FAQs like "What’s the origin of okay? to urgent pleas like "Can you tell me the correct plural of cactus? to unusual queries like "Is there a word for when inanimate objects conspire against you?" I even tackle the most maddening question of our time, one that has plagued us since the dawn of the digital age: What idiot programmed my spell-checker? Throughout this book I clear up confusions, clarify distinctions, and sort the tall tales from the truth. I calm your word-jangled nerves and dispel your lingering verbal doubts. I tell you how to avoid common mistakes and when it’s a mistake to avoid something that’s common. I settle your bets and debates before they become lawsuits. As your verbal chef de cuisine, I have concocted in these pages a salmagundi, gallimaufry, and olla podrida of word lore, wordplay, and advice aggressively seasoned with spicy opinion and a generous pinch of salty humor. My menu was inspired by people like you — people curious, confused, or plumb crazy about words — so I think you’ll find it savory, nutritious, and a whole lot cheaper than a meal at most restaurants. Here’s a tantalizing sample of what you’ll be tasting at this feast. In “Once Upon a Word” you’ll discover why prose is purple and why you mind your p’s and q’s. You’ll find out who put the corn in corned beef, who put the X in Xmas, and who was the first peeping Tom. And you’ll learn some unflattering words — like Oslerize, to kill all men over forty — that have come from some unlucky people’s names. In “A Slough of Solecisms” I deliver you from unwitting error and misperception by explaining, for example, the difference between i.e. and e.g. ; why you should never, ever write ’til; whether you are done or finished; what’s up with What it is, is; and why to beg the question doesn’t mean what you may think it does. In “The Grandiloquent Gumshoe” I patch holes in your vocabulary, recover your lost locutions, and track down the missing pieces in your verbal picture of the world. Here you’ll find terms for a host of word-needy concepts, including the snappy comeback that you think of too late, the stuff that people attach to their car aerials, the female counterpart for phallic, when a trademark becomes generic, and a person who has an annoying habit of dropping in uninvited at mealtimes. In “The Elegance of Style,” while you (w)rack your brains about (w)rack and the meaning of bimonthly (is it every other month or twice a month? ), your wordwise guide will save you from apostrophe catastrophes, opine on the plural of octopus, tell you how to distinguish people and persons, and rule on whether it’s Welsh rabbit or Welsh rarebit. In “A Civil Tongue” I show you that becoming a better speaker is a lot less daunting than losing weight or learning French. I give you sound advice on why primer rhymes with swimmer, why you should pronounce the t in tsunami, where the stress should fall in patina and formidable, how to handle French mouthfuls like cache and denouement, how not to pronounce mischievous and heinous, and how to pronounce oft-misspoken names like Brontë, Coleridge, Halley’s comet, and Ayn Rand. You’ll also learn how colonel came to be pronounced like kernel, why the b in debt is silent, and what it’s called when people say ath-uh-lete and drown-dead for athlete and drowned. In “Born in the U.S.A.” you’ll be sitting in the catbird seat and happy as a pig eating pancakes as I serve you up a heaping plate of all-American words and expressions. Your mojo will be workin’ in a New York minute as you discover the amusing origin of schmuck, find out why we call a bathroom the john, and learn where the H comes from in Jesus H. Christ. You’ll have a bitchin’ time, I guarantee. Finally, in “The Wonder of Words” you’ll learn about mondegreens like José can you see, lost positives like gruntled, and palindromes like Was it Eliot’s toilet I saw? I’ll expose the great -gry hoax, treat you to a taste of Cockney rhyming slang, and teach you the word for words like brunch, guesstimate, and palimony. And that’s not all, as the marketing wonks are wont to say. These chapters are liberally garnished with even more delicious verbal diversions. In the "Quote Unquote" feature you’ll encounter an eclectic selection of my favorite wise and witty words. In the "Fascinating Fact" feature you’ll discover priceless curiosities like words in which q is not followed by u, the three earlier names of Scrabble, and the real title of the painting known as “Whistler’s Mother.” And if your taste turns to fun and games, there are oodles of Bodacious Brainteasers — like “Tasty Toponyms,” “Are You Brandiloquent?” and “The Brobdingnagian Rubicund Saxiphage” — designed to test your verbal mettle. But don’t just take it from me. See for yourself. Thumb through the book and sample the fare. I think after a few bites you’ll agree that your wordwise guy and wise guy of words is also a wise word guide. Well, what are you waiting for? Turn the page and get an edge in wordwise. Copyright © 2005 by Charles Harrington Elster.